As we wrote about before, we always ask a few questions of the attendees of our monthly webinars, so that we can get a feel for what they're working on, the challenges they're facing, and how we can improve our software and services. This is a very common barrier or concern. My view is that “lack of time” is a problem to solve, not an excuse to fall back on. How can we free up time for continuous improvement? Can we solicit ideas from employees and managers about how to free up time? Asking these questions is a great way to get things rolling and make more time for continuous improvement. See a video of a ten-minute presentation I gave at the Lean Transformation Summit on this topic. Beyond a lack of time, many organizations have a lack of money. That’s why the Kaizen approach to improvement encourages us to “use our minds before our money” and to put “creativity over capital.” If we don't have excess funds to dump into solving problems, we have to challenge ourselves to be more creative about solving a problem in a less expensive way whenever possible. As we often do in the Lean mindset, we need to ask “why.” Why is there resistance? What are people resistant to, exactly? In my experience, people want improvement. They want things to be better. But, they might naturally (and understandably) resist ideas that are being forced on them by others. That’s why we have to engage everybody and solicit ideas broadly. Presenting Lean as a way for people to improve their jobs and their organization gives them the opportunity to voluntarily get involved in improvement, and decreases the resistance often found when orders are issued from above. Again, if people aren’t buying in, then we need to ask, “why.” We can’t make people participate. We have to make sure people understand the need for improvement. We can draw them into the improvement process by letting people work on the improvements they care about. Leaders have to create an environment where people are naturally enthusiastic about improvement. Quick fixes are a problem if people are just fixing symptoms rather than fixing underlying root causes of problems. Giving people a little guidance in this area will go a long way toward getting the ball rolling with improvement, and helping people get better at solving root causes. However, If the complaint is just that people are identifying small improvements, that's ok! Small improvements add up to make a big difference, and with a good culture of continuous improvement, we can build up their confidence to where they are more willing (and able) to take on bigger challenges. 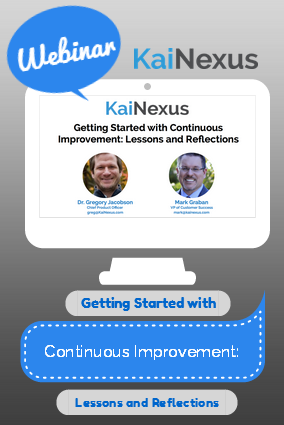 While we, at KaiNexus, are big fans of the RIE approach (and our software supports that), we are glad you realize that RIEs or “Kaizen Events” are not the only way to make improvement happen. Unfortunately, some organizations get really fixated on the RIE approach. The leading “Lean healthcare” organizations, like ThedaCare and Virginia Mason Medical Center, use weeklong events AND daily continuous improvement practices. Check out our future webinars here!